Yep and most people don't carry a low pressure gauge so that is why I say you should see a wrinkle. Softer the snow the less air you need..considerably less. Firm snow more air but tire should still wrinkle a bit. Same thing goes for riding sand dunes. Which need either to be frozen or after a good rain storm. 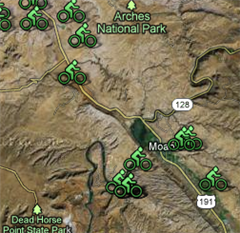 Now that is a fun fatbike ride! I carried a low pressure tire gauge when I first started fatbiking. I don't anymore. It helped in the beginning but, I do it enough that I can go strictly by feel now. I do carry a hand pump, though. Many times I have to add a bit of air back in for the long descents back to the car. From this morning's ride up AF. The fresh snow from yesterday's storm was amazing! I’ve got a set of the Vee Tire Bulldozer 26x4.7 and they work great. Yep I always have my Lezyne. Definitely adjust as you need. I need to come try AF sometime. Seen more than a few folks photos in AF. Looks fun. Let me know when you want to come down this way. I'll be your guide. We could have a Bogley day. Maybe after the first of the year on a Saturday? Hands down this morning was some of the best biking on snow I have ever experienced. Conditions were perfect. Tires needed to be firm just a hint of a wrinkle. Starting temp was 3F when I finished I think it had warmed up to 24F. I rode up Pipeline and found the Mule's Ear Connector rode it to the top. Local Moose have added a bit of challenge by post-holing the last bit of the Connector trail. When I reached the cross country trail I turned around and headed back down to 365. Roughly 6 miles of trail. Did it twice. 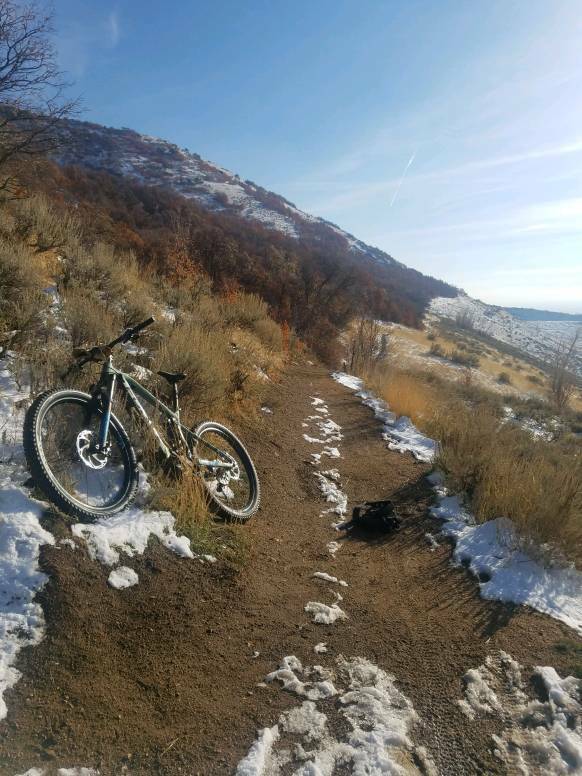 Next time I might try that Flats trail just to see what it is about. Yesterday morning riding the BST from 12th Street headed North. I might post some video later, pretty uneventful but just to show you the conditions. My wipeout from Saturday morning, haha! Conditions were amazing! Mounted up this tire on the front last night. Looking forward to trying it out. Options for 27.5" fat have been limited. Finally the list is growing. I've been riding Barbegazzi's but, while they are fast rolling and lite, I'm wanting more bite and traction. Terrene Cake Eater 27.5 x 4.5". The Forest Service groomed much of AF Canyon yesterday, so I made first tracks on the Timpooneke Campground loop in the afternoon. So amazingly good! Even with the grooming the snow is soft and deep and I had to drop the rear air to about 2 psi for the long climbs. Go get it! 2nd tracks down the SFLDC #252 and Winter Pass #252A trails Saturday morning. So much fun! The Forest Service had groomed them Friday afternoon and they had set up pretty good by Saturday morning. Not the easiest of trails to get to. Or, more accurately, not the easiest to get back out of. It's 4 miles and 1,400' of steady climbing to pedal up to the Summit of the Alpine Loop, followed by the 1.7 mile downhill run on #252. To get back up to the summit you pedal up the Cascade Springs road. It's super steep and not an easy pedal during the summer with no snow. Add in deep snow and, if it's soft and chewed up by snowmobiles, it's a real slog. Sometimes I've had to push the bike up nearly the entire way. Saturday wasn't too bad thankfully. Silver Lake Flat and Lower Mill Canyon goodness!